Uses: Crossed with Toulouse for meat production, sometimes as a broody. Eggs: 20 to 40 white eggs per year. Weight: Gander: 10 – 12.7 Kg. Goose: 8.2 – 10.9 Kg. Colours: Brown / Grey (most common), Buff, White. Useful to Know: The dewlap is slow to develop in some African Geese, taking 12 to 36 months to develop fully. Usually a gentle breed, despite their size. African Geese are some of the largest domestic geese, the Ganders weighing up to 12.7Kg. They are close relatives of Chinese Geese and have a similar ‘knob’ above their beak, being a descendent of the Swan Goose (rather than the Greylag that other breeds of geese are descended from). They lay far less eggs than Chinese geese, normally producing somewhere between 20 and 40 eggs per year. Despite the confusing name, African Geese are believed to originate from China. 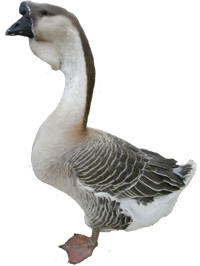 African’s are often crossed with Toulouse Geese to create a commercial hybrid bird used for meat. African geese normally have a very docile temperament. The geese tend to be stockier, with a larger keel than the gander who also has a higher pitched call than the goose and is usually larger in size. In France, the African Goose is called L’oie Africaine. The Brown / Grey was standardized in the UK in 1982, the Buff in 1999 and the White in 1982. The African goose entered the American Standard of Perfection in 1874. African Gander owned by Graham Hicks. Photo courtesy of Rupert Stephenson. African Gander owned by C&M Ashton. African Gander owned by Mike Sumner. African Gander owned by Richard Hedges. African Goose owned by Mike Sumner. Photo courtesy of Mike Sumner. African Goose owned by Graham Hicks. Photo courtesy of Rupert Stephenson. African Goose. Photo Courtesy of the British Waterfowl Association. The following books are available. Links take you to the Amazon or other sellers’ pages. Please leave a comment below if you can provide further information or have a question about this breed. How Comfortable Are You with Duck & Goose Down Production? Why is my Cockerel White?